Children under the age of five are least likely to survive a malaria infection because they have not yet built up their natural immunity to the disease, making malaria one of the leading causes of child death. LLINs are mosquito nets, usually bed nets, that not only physically protect against malaria-infected mosquitoes but are also treated with an insecticide that lasts for several years and in that time kills any mosquitoes that may otherwise be able to find possible gaps or tears in the net. Since most mosquitoes bite during the time from 10 p.m. to 2 a.m., bed nets are a highly effective means of protection against malaria. Depending on the region they also protect from other diseases transmitted by the same vector species, such as dengue fever, yellow fever, and forms of encephalitis. Universal coverage. With children under five being most at risk of dying from malaria, distributions of LLINs have in the past often targeted families with children in that age group. The World Health Organization (WHO), however, no longer recommends these targeted distributions but rather universal distributions as the Against Malaria Foundation (AMF) conducts. When a distribution manages to cover almost every household in a region, likely community-level effects include a strong long-term decrease in the mosquito population due to the insecticide but also because the mosquitoes die if they cannot feed. Concerns. One worrisome development that needs to be closely monitored is the possible adaption of the mosquitoes. Resistance and changes in the behavior of the mosquitoes are still very limited phenomena and thus do not infringe on the effectiveness of LLINs, but AMF monitors this situation closely. Other concerns are minor. Any accounts of allergic reactions to the insecticide have been limited to anecdotal evidence of minor itches that went away after the net was hung for a few days (GiveWell 2013). Several studies have not been able to confirm any delay in the development of natural immunity in well-protected children (ibid.). Economic concerns are also marginal since quality nets are often unavailable or unaffordable for most people on their local markets (GiveWell 2012) and distributing them for a nominal fee has also only reduced the efficiency of the intervention (GiveWell 2013). Still AMF takes care to buy nets from local factories in the respective countries if such factories exist (AMF 2011). Conversely, Sachs and Malaney (2002) see a strong correlation between the reduction of malaria rates and increases of the GDP. Finally, AMF has also implemented measures to thwart concerns over unjust distributions of nets in tight-knit communities. The Against Malaria Foundation (AMF), founded in 2004, is one of several organizations that support local distributors by funding the hundreds of thousands of nets that are needed in LLIN distributions, but AMF stands out because of its strong commitment to transparency and self-evaluation. Nets. Donations to them are used exclusively to buy nets. In cases where AMF has funded non-net costs, these funds have been taken from donations that were specifically earmarked as unrestricted (e.g., a $500,000 grand by Good Ventures). Hence, donors can be confident that for each roughly $3 that they donate one net will be bought. If you wish to mark your donation as unrestricted, however, please contact AMF directly. Process. AMF specifically targets regions with high incidence of malaria and a large net gap, the gap to universal coverage with LLINs that they hope to close. Then they work with distribution partners, organizations active in the country such as Concern Universal, to collect detailed data on net use, condition, and need in a predistribution registration survey (PDRS). Third, whenever feasible they collect detailed case rate data on the incidence of malaria in the region covering twelve months preceding and six months following the distribution. 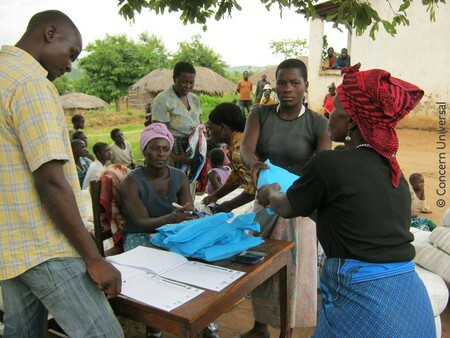 During the distribution, they require the distribution partners to provide extensive reports with photos and videos of the distribution, have independent supervisors present, and provide education on malaria and the use of nets to the new owners. Finally, the distribution partners also have to conduct postdistribution follow-up surveys every six months for three to four years. All this data and monitoring ensures that AMF or the distribution partners can avoid theft of nets, can intervene with educational measures should they find that the net use dropped and can monitor and optimize the continued effectiveness of their interventions. Tax-deductibility. Your donation to AMF is tax-deductible in a number of countries. Please check AMF’s overview of their international charity status for up-to-date information.